Warehouses present one of the most challenging environments for the choice of flooring since HGVs are constantly passing through, while shuttling forklifts keep loading and unloading heavy pallets. Warehouses are an essential part of manufacturing and distribution process, so many of them have a 24h operation. Changing an existing flooring of a warehouse is not an easy decision, but if you have already made up your mind, you should know what options there are. Here are a few considerations. It goes without saying that the safety of the employees is the most important aspect of any industrial environment. In addition, it is the number one factor for staff absenteeism, so choosing a floor that provides excellent safety measures is an investment that could make a big difference. Like any modern industrial environment, a warehouse floor needs to be clean and bright with clearly mapped out zonal markings, as well as clear demarcation lines. 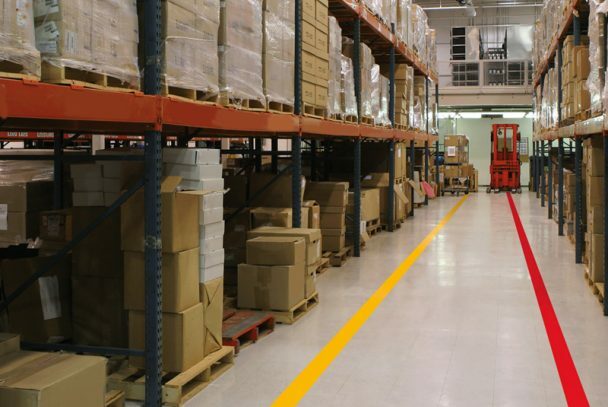 Choosing a floor that clearly indicates the danger zones as well as pathways for vehicles ensures smooth flow of goods, but also enhances the workers’ safety and efficiency. The next thing to consider is the amount of traffic those zonal and pathway markings are going to be exposed to every day. The floor paint you choose needs to be durable enough to withstand the relentless force of feet and wheels. As in any business, the amount of money you have to invest is a real-time issue that depends on your current financial situation. Still, the second most important thing to consider is the lifetime cost of the flooring system you are looking to buy. In many situations, what seems like a good value in the short term, can look much less attractive after 20 years. The question is – how often will you have to repair or replace the floor over this lifespan? And keep in mind that the costs don’t include only labour and materials, but also the operational standstill of the warehouse. New automated retrieval systems, pallet racking, and increased amount of traffic will prompt you to restructure the floor plan. However, as mentioned above, construction works are costly primarily because of the work interruption. The solution lies in a flexible flooring system that can be remodelled easily. Many manufacturers now offer tough PVC interlocking tiles that are perfect for warehouses that cannot afford to stop their 24/7 operations. Aside from offering excellent slip resistance, they are also fire retardant and they reduce dust and noise. These tiles also protect the substrate from any operational damage, which is important for leased buildings. When talking about busy warehouse operations, the appearance is probably not the first thing that crosses your mind. However, making an extra effort to impress potential clients is never an option you should ignore. Aside from those demarcation lines and freshly painted pathways in different bright colours, having your logo branded into the flooring sends a clear message that the business is in full swing. When thinking about flooring options, select the one that lets you achieve this look easily. 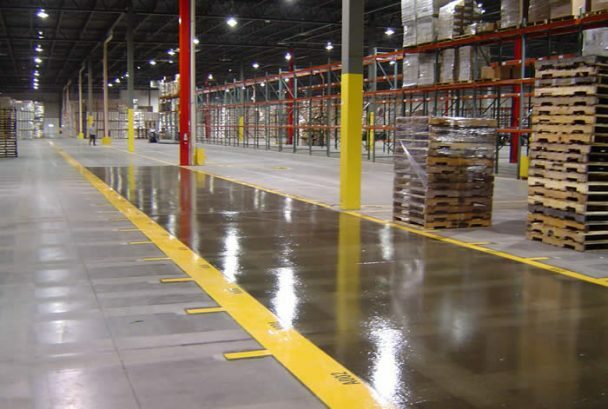 Some industrial and warehouse flooring solutions are easier to maintain than others. Keeping the floor clean and dust-free provides a safe, hazard-proof environment while at the same time increasing the life span of the investment. Concrete is the prevailing warehouse flooring material around the world, but it needs proper protection. Used primarily in areas where spillage of common fluids is likely to occur, premium concrete floor sealers are also suitable for areas of high foot and wheel traffic. The choice of the flooring system for your warehouse depends mostly on the size of your operation, the level of mechanization and the long-term business plans.